Mix first ten ingredients in saucepan. Simmer 20 minutes, uncovered. Then add catsup and next two ingredients. Bring to boil. Beau Monde is a specific brand of seasoning salt. The predominant flavors are nutmeg, mace, clove, allspice, white pepper and celery salt. Our family has used this recipe for many years. One of my sisters still has the 1951 or so magazine where our mother found it. We leave out the liquid smoke and the cayenne pepper. This is wonderful on roasts, but my favorite is to coat meatballs in a batch of the sauce. Wow, very cool! Do you remember if the magazine attributed it to Bert, or if someone decided to make this recipe his own? (Over Ernie’s objection I’m sure!) And are you a Texan? I’ll give to give this one a try, either way! 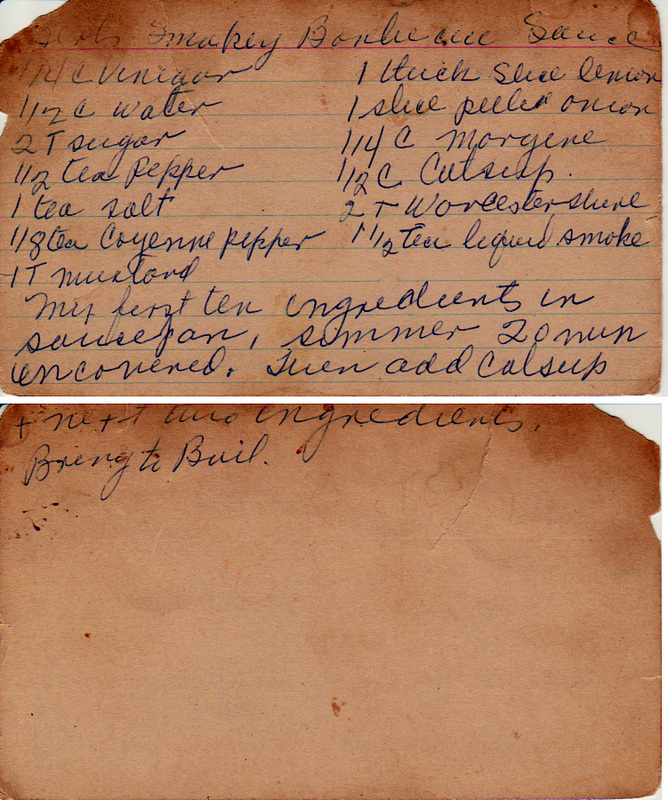 There was a second recipe for a Lemon Barbeque sauce that is dynamite on chicken (and pork and hot dogs!). Both from the same page in the mag. Both of these recipes have been used regularly by all 5 of my sisters having been in regular use while still at home. And my daughter makes them both as well and many of her cousins too. Could you share with me the recipe of the lemon bbq dynamithe souce? By the way, the 3rd line on the right side of the recipe should be Margarine (we use butter). There isn’t any Mayonaise in the recipe. Whoops! Good catch, thank you! You’d think I’d be better at figuring out handwriting because my handwriting is so awful. Seriously. We (my sister and I) have been copying recipes on Yesterdish-embossed cards to give to people and my handwriting looks like a ransom note. grew up in Springfield, but the first home I bought was in Portage County just a bit off of Rt 82 near Hiram. If you search for Good Housekeeping July 1951 that edition had a 36 page Barbeque cook book. Likely this is issue where we got the recipe. I saw the cook book segment for $2.50 abe books.com. a couple on Ebay of the full edition. 62 years! I’ll get the Lemon BBQ recipe for you. Thank heavens for Yesterdish Rescue! I have misplaced the Good Housekeeping cookbook that supplied this recipe to, first, my dad & then me since the mid 50’s–in Houston, then Denton, then Illinois, then New York City, then Ontario and also Katy TX & back to Austin. Nothing, absolutely nothing, is so good on chicken or brisket. Margarine is indeed the fat component but we leave out the extra sugar for our Texas palates.